Identical in format to the companion book on Dogs, Awesome Animals: Cats is another journey through entertaining, at times unbelievable, always interesting information on our feline friends. It opens with a history on cats beginning in ancient times and the important role they played in worship. Cat fossils over fifteen million years old have been found. There have been cats in art dating back 7,000 years. From Ancient Egypt to travel on the Mayflower and onward, cats in history prepares the reader for the wondrous trail of facts – humorous and incredible – that this collection for the 8-12 year old is compiled. The recorded cat adventures will prove that truth is stranger than fiction with feline exploits, statistics, stories of survival, heroism and bravery, and bizarre stories of tyrannical cats. We learn about cats as Gatekeepers, Ambassadors, heirs to fortunes, and spoilt and over-indulged moggies. There are Award winners, actors, pets of famous people such as Popes, Presidents, Prime Ministers, writers and other prominent people. Look for the stories about toilet trained cats, and the first Cat Café that opened in Sydney in 2015. Jokes, poems, trivia and rhymes add humour and create laughter. The gorgeous photos that appear throughout the book are of residents of the Little Legs Cat Rescue, Queensland. 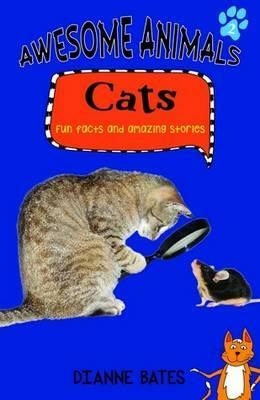 As with the Dogs edition, this book emphasises the importance of responsible cat ownership and care, and stresses the need for research before choosing a pet as it is to last for the lifetime of the animal, therefore must be taken seriously and entered into with commitment for that lifetime. Useful links and information on Pet Shelters are also listed.